Porsche mulling diesel option for Macan in the U.S.
Porsche has plans to offer a diesel option with the Macan crossover in the U.S. by the end of 2015. "We are now busy with the development and the engineering," Andre Oosthuizen, vice president of marketing for Porsche Cars North America Inc., told Automotive News. "I can confirm that V6 diesel offering with about 245 hp." The diesel variant would reportedly be priced below $60,000 USD, positioning itself between the entry-level Macan S and the high-performance Macan Turbo. 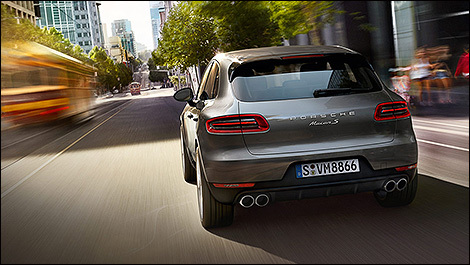 The new diesel is expected to be a version of the 3.0L turbodiesel V6 offered on the Macan in Europe and other markets. We may get a preview at the 2015 Los Angeles Auto Show, with sales to begin in late 2015 or early 2016. As for the 4-cylinder Macan currently sold in China and the U.K., Oosthuizen said it's "not under consideration for the foreseeable future" for the U.S.